Communication processes and tools will support person-centred care for the older person throughout their hospital journey and at their transfer of care to the community. The confused person and their carer/family can become overwhelmed in hospital. Person-centred care is key to optimising health outcomes and patient satisfaction. Health professionals should work in partnership with the older person and their carer/family to develop a care plan with shared goals based on the person’s values and experiences (1,2). 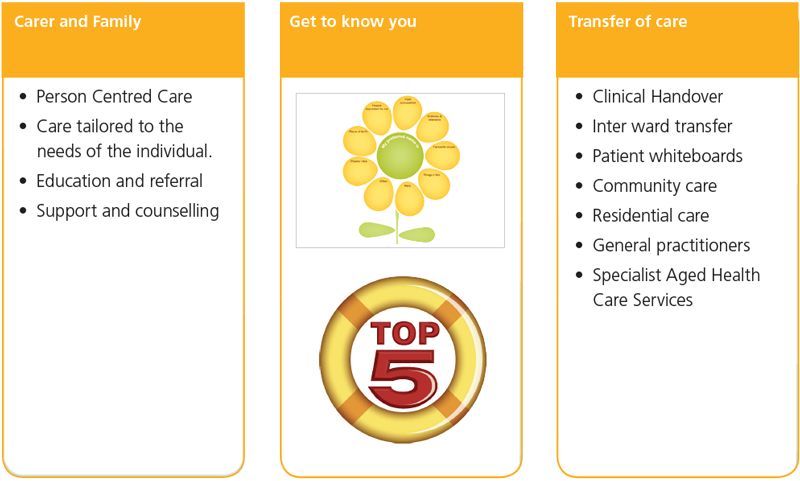 clear and succinct communication for transfer of care, and between all members of the multidisciplinary team. The communication method should be appropriate to the individuals and setting, e.g. face to face, telephone, telehealth, written and electronic. NSW Ministry of Health and The Royal Australian and New Zealand College of Psychiatrists. Assessment and management of people with behavioural and psychological symptoms of dementia (BPSD). A handbook for NSW clinicians. NSW Health and RANZCP, 2013. Dow BH, B Bremmer, F &Fearn M. What is personcentred care? A literature review. National Ageing Research Institute 2006.